1. All persons having a reading must be aged 18 or older. 2. The reading is for guidance only. 3. During the first 5 minutes of a reading, if a connection with the caller cannot be found the reader (myself, Psychic Vir in this present disclaimer) will agree with the caller the right to end the call and only in this instance a refund be given. 4. If during the reading the caller gets aggressive the reader reserves the right to end the call and no refund is offered. 5. Subjects that cannot be discussed are death, fertility health and any legal matters. (This is a standard policy however there is a certain flexibility on that point). 6. 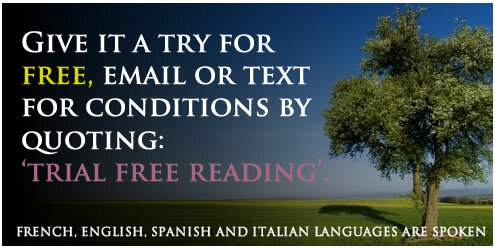 If during the reading the reader feels that the caller needs more help than a reading can give them or they need more professional help, the right is reserved to end the call early. 7. Having a reading should not replaced help or treament offer by professional persons. 8. All readings must be paid for in advance and funds cleared before the reading can go ahead. 9. In paying for the reading you are agreeing and accepting this disclaimer.